Thank you to our sponsors, artists, organisers and the public for enabling the Aldenham Art Festival to be such a success every year! GREAT ART IN WONDERFUL SETTING! 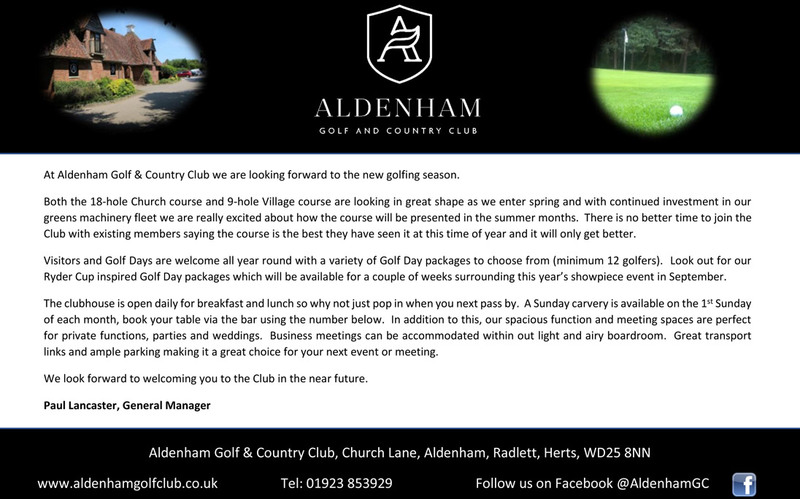 In association with Aldenham Golf & Country Club, the perfect setting for golf days, casual dining, events and weddings. Aldenham Church is the perfect setting for an Art Festival. Set in the small village of Aldenham, close to the towns of Radlett, Bushey and Watford, in the Hertfordshire countryside St John the Baptist church is a wonderful mediaeval church of outstanding beauty where Christians have worshipped since the 13th century. The addition of a large selection of original works of art from artists in many mediums and styles makes it the ideal place to spend an hour or two, browsing, having tea and buying something to fill that space on your wall. There will be a big selection of both framed and unframed original art and prints to browse and buy at affordable prices as well as refreshments and maybe some live entertainment. 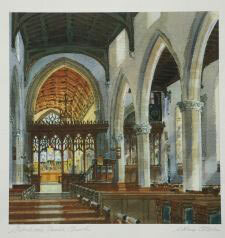 All income from the Art Festival will help to preserve the fabric of this beautiful and historic church for the future. Your donations on entry will help this and artists will be donating a fee to hang their work and a commission on sales. If you would like to attend the Preview Evening and get an early choice of the art, on Thursday 13th, your advisory donation of £5 per adult would include a glass of Prosecco, wine or soft drink. Finger food will be served and there will be live music. If you are an artist and would like to exhibit please visit the artists tab or scroll below. CLOSING DATE - August 31st 2019 (Or when entries are full. )Please enter early as there is a limit on the number of pictures to be accepted. You will be able to change your entry up to the closing date but your entry fee is non-refundable. Exhibit your work in this beautiful church between the 12th and 15th of September. Take advantage of this superb event and register soon for your pictures to be hung in this medieval setting. The organising 'hanging team' will place your work either from boards or strategically placed locations around the church for maximum effect. You will not need to be there for this and the team's decision is final. The event will be advertised as widely as possible to attract a good buying public and we will be holding a preview night as well. You can download the REGISTRATION form for WORD by clicking here. You can download the REGISTRATION form for ACROBAT READER (PDF) by clicking here. You can download the RULES for ACROBAT READER (PDF) by clicking here. Artists will get one free pass for the evening and guests will be admitted for a £5 donation to the Church which will include Prosecco, wine or soft drink. Free for children with adults. If you cannot make this hand in on time, please arrange for someone to do it for you. At the church on SUNDAY 15th SEPTEMBER between 4.30 and 6pm If you are unable to collect any unsold works you must arrange for someone else to do so on your behalf or email us as we cannot store or arrange delivery. The Exhibition will be manned by experienced people at all times and you are NOT required to steward. We will allow purchasers to take the picture with them, when they have paid the full selling price. Alternatively a non-refundable deposit of at least 10% will be taken to reserve the picture and the balance paid on collection. Pictures must be properly and securely framed (or be box canvassed) and have a string or wire at the back. They must also have a label on the back showing the title, artist, media and price and a separate label on a string with the name and title on. There is no upper size limit on framed work providing we have space to hang them. FRAMED PICTURES MUST BE ORIGINAL WORKS OF ART, NO PHOTGRAPHS, DIGITAL ART OR LIMITED EDITION PRINTS. Most forms of art are acceptable as unframed work including original art on unmounted canvas or thin board (i.e. hardboard or similar) in any medium including Giclee prints, digital and photographic art. All work MUST be of your own making. All items MUST be enclosed in a clear plastic or cellophane sleeve with a stiffener or mount where necessary and the pack must not exceed 4mm in thickness. Canvas works mounted on stretcher bars are NOT acceptable. All unframed work MUST have a label on the back clearly showing the name of the artist, title, medium and price. All items must be for sale and of a suitable subject for the setting. Use the word ART followed by your initial and first three letters of your surname as the reference, so if my name was John Smith I would put ARTJSMI. Payment for sold work will be made to artists as soon as possible after the show ends. The success of the exhibition relies on good publicity; we will do all we can to maximise on this. But YOU can play a vital role as well by telling all your friends, relations and any one you can think of about it as well as using your social media networks. Public liability Insurance is provided, however, the insurance of all works is the responsibility of the individual person. 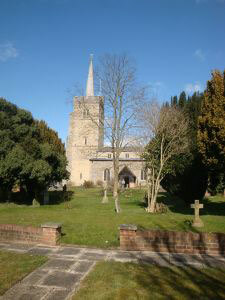 Aldenham Church or the organisers cannot accept responsibility for theft, loss or damage no matter how caused. After the great success of last year’s show this year's event was staged over the weekend of Thursday 14th - Sunday 16th September in the beautiful setting of Aldenham Church. With well over 430 paintings both framed and unframed to choose from it was an eye-catching exhibition with some amazing original, contemporary and traditional works of art to browse and buy at affordable prices from £20 - £900. The event kicked off with the Preview evening with delicious canapés and drinks kindly supplied by Aldenham Golf and Country Club to whom we are enormously grateful. not only for this but also for the massive support they have shown us this and last year. Well over 100 people came to this evening and in the following three days many more came to view the works and to sample the delicious home made cakes and refreshments. The addition of the new browser racks made a huge difference to the public's access to them and lots more sales were made of unframed work than before. This will be further expanded next time. In all, 58 pictures were sold and over £5,000 was taken on sales. The commission on this coupled with the entrance donations and refreshment sales meant that over £4,000 was handed over to the church for much needed maintenance of this wonderful medieval building. But it wasn't just about sales, lots of people came and had an enjoyable couple of hours admiring the pictures, the historic building and enjoying a great social occasion. Huge thanks go to everyone who helped to put this show on and supported us. Plans are finalised for next year and the 2019 event has all the signs of becoming one of the biggest and finest art shows in this part of the world. Roaring success for our first festival! Thank you to everyone who either visited, attended or exhibited at the first Aldenham Art Festival and making it so successful. 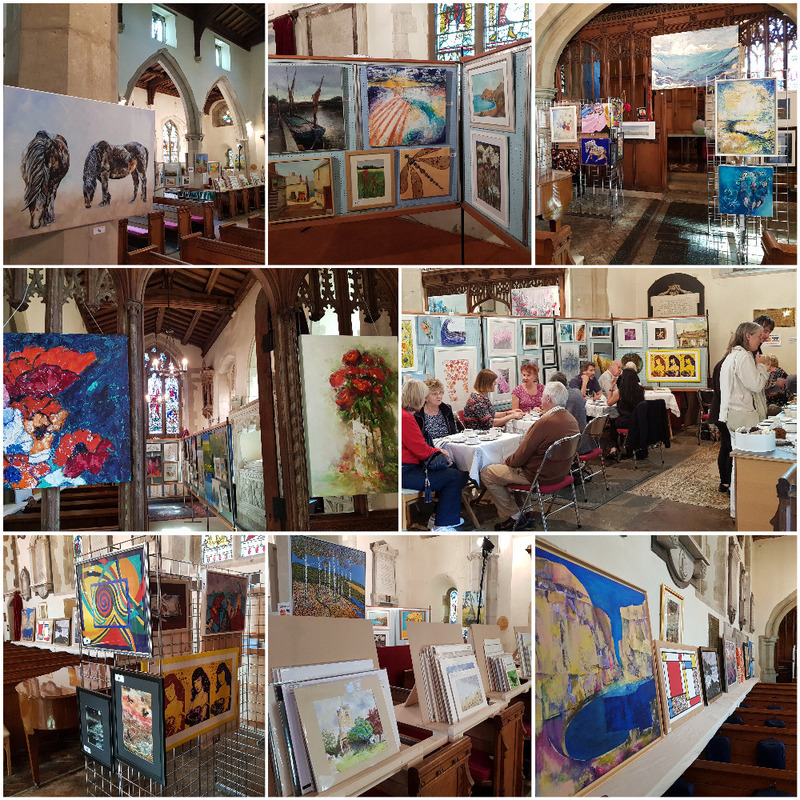 It was amazing to see this beautiful 12th century church not only full of people but also full of quality original paintings, collages and other mediums – 209 framed and 215 in ‘browser racks’ made it a massive show. With so many styles, sizes and mediums to choose from the show must be considered amongst the best in the County for lovers of art seeking to fill a space on their walls, and many did so! The event brought many local residents into the church for the first time who were surprised at this little gem in the heart of the village. It was also a brilliant social occasion for parishioners and local residents. The event began with a Preview Night on Friday 15 th September with over 180 guests and artists attending; they were treated to Prosecco, wine and soft drinks accompanied by trays of wonderful canapés all with the compliments of Aldenham Golf Club and accompanied by live music from Harpist Lucy Haslar. The event continued over Saturday 16 th and Sunday 17th , with delicious home-made cakes and refreshments available to all visitors. During the event a pianist played soft light music, at times other musicians and singers accompanied him. One very enthusiastic and talented singer was local resident Julia Romanenkova who sung her native Russian ballads. Over £3000 was raised for the church and will provide much needed funds to preserve this wonderful building. 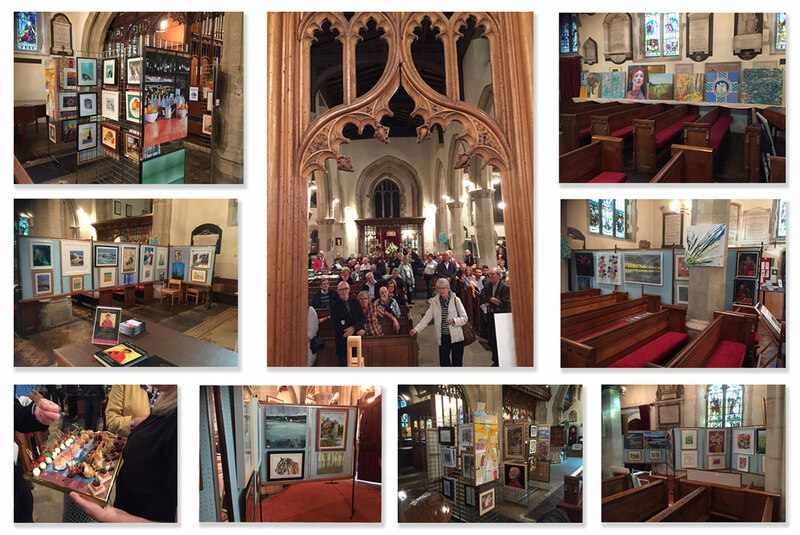 At the close of the Art Festival thirty-eight paintings were sold raising a total of nearly £4000 plus donations and refreshment money. Pretty good for a first time! Paul Lancaster, General Manager at Aldenham Golf Club said ‘We were more than happy to supply the refreshments and some sponsorship for the Aldenham Art Festival. It was a good opportunity for us, as new owners of the club, to get more involved in the village and the community. Plans are made this year and with some improvements in mind 'Aldenham Art' will become a landmark event in the calendars or artists, buyers and visitors alike.